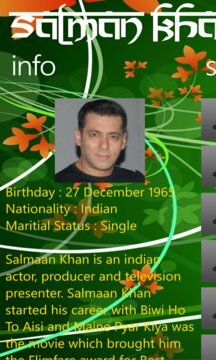 If you are a Fan of the Bollywood Khans then this App is for you it showcases Salman Khan, Aamir Khan, Imran Khan, Shahrukh Khan and Saif Ali Khan. -- Information about the Actor. -- Top songs from the selected actor which can be downloaded from the Music Store. -- Wallpapers which can be saved in the Gallery and also set as Lock Screen. -- Supports all Tile Sizes. -- Customize Tiles for specific actor.